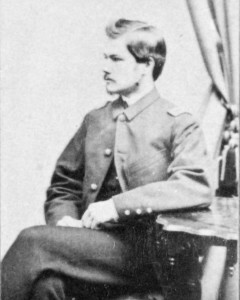 The handsome and mustachioed Charles Hitchcock Marland (1843 -1903) was one of the five Marland cousins, all grandsons of Andover industrialist Abraham Marland, who served together in Company G of the Massachusetts 44thInfantry. Charles was the son of William and Sarah (Northey) Marland and the brother of Andover’s Medal of Honor winner William Marland. He grew up in the “Rose Cottage” and was a member of the Punchard School’s first graduating class in 1859. He was mustered, along with his four cousins and nine other Andover men, in September 1862. They left Boston on October 2, 1862, escorted to the steamboat with a parade down Boylston Street led by the full Gilmore Band. All fourteen served their nine-month enlistment in North Carolina and returned home to Andover unwounded. Charles Marland was married in January 1867 to Laura (Laud). He lived after his marriage on Chester Street in Ballardvale, where he was the station agent and postmaster and the father of two sons.